"Whoever comes, I'll kill them. I'll kill them all." That's an awesome quote from Keanu Reeves in John Wick: Chapter 2, one of the best action films in recent memory. 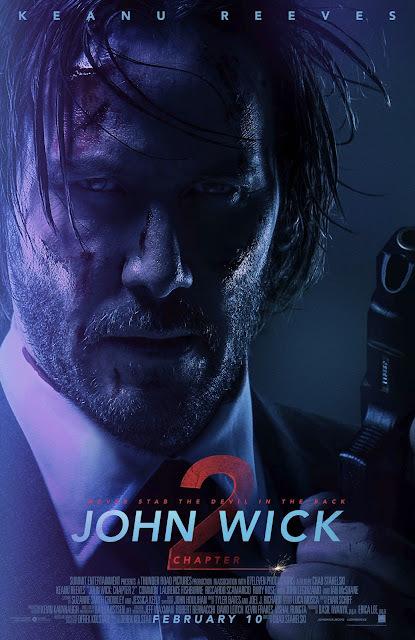 Reeves reprises his role as John Wick, who has gone back to retirement 4 days after the events of the first film. John is asked by crime lord Santino D'Antonio (played by Ricardo Scarmaccio) to fulfill his promise he made years ago. After John refuses, Santino destroys John's house with a grenade launcher. After consideration, John decides to fulfill the promise: killing Santino's sister, Gianna D'Antonio (played by Claudia Gerini) so Santino can claim her seat at the High Table. After the promise is fulfilled, Santino puts out a $7M hit out on John. Now, John must fend off other members of the Continental, & get revenge on Santino. Keanu Reeves's performance is awesome. Chad Stahelski's direction is excellent. Derek Kolstad's screenplay is brilliant. The cinematography by Dan Laustsen is amazing. The film editing by Evan Schiff is excellent. And the action scenes are awesome. This is one of the few sequels that outshines the original.